I just got one of these because it was pretty cheap and I knew there were folks (at least one) here that are interested in the circuit. I don't have time to trace it out, but I have some pics that may make the process pretty simple. If there are any questions about values then just ask me and I'll get back to you as soon as possible. CHEEZOR wrote: I just got one of these because it was pretty cheap and I knew there were folks (at least one) here that are interested in the circuit. I don't have time to trace it out, but I have some pics that may make the process pretty simple. If there are any questions about values then just ask me and I'll get back to you as soon as possible. if you can add the component values,thanks a lot,i'd like to make a comparison with other boosters i have. a) All the blue circles mean ground. b) All the red lines are the traces that cannot be seen in the picture. They might not be correct, but they are as close as I could figure out using my multimeter at the time. Also, there are probably more that I did not find on the other side of the board. c) The 2 big blobs of solder are the lugs of the push pull switch to turn the effect on or off. d) I dont know what the values of the unmarked caps are. Im assuming that if we drew out a schematic then the values would become pretty obvious to some here who have experience with boost circuits. e) The big red "?" is there because those points were connected according to the multimeter, but I did not see how. There are traces on the back side that I could not see though. I have a parts list somewhere, but I will have to find it. Im pretty sure I wrote down all the values that were written, but you can probably see most of them in that pic. I found the list I made. I think the part name is the first line since that is the google search which brings up the most Op Amp related results. The other parts are unmarked. 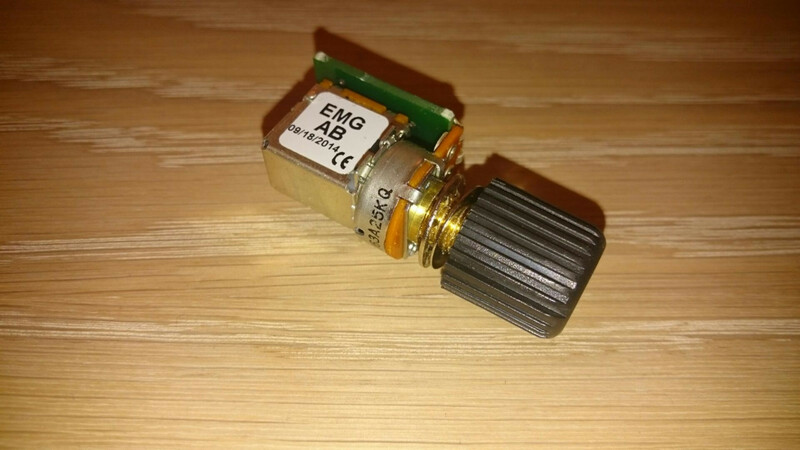 The pot is probably marked and Im assuming that is 25K like all the other EMG pots, but I would have to double check to be sure and I dont know where I put the damn thing at the moment. I just ran across this: http://freestompboxes.org/viewtopic.php?f=3&t=15541 which is probably very similar. Doesn't look exact (just from the number of caps), but probably still close. CHEEZOR wrote: I found the list I made. thank you,very kind,you did a great job. yes it looks very similar to PA2,this one is made with a single opamp,PA2 is double,one with buffer and one boost with pot,and the switch deviates the signal from the 2 sides. AB does the buffer with switch,bypassing the pot,i guess its a 500k. also,one side of the pot should go to pin 2 not 3,first cap in input should be 100nF. i don't think its really necessary to draw a new schem or layout for this,it should be enough to change some values to the PA2 in that thread,anyway,PA2 is more guitar oriented,AB is good also for a bass,that's what i see in the circuits. I just wanted to confirm that my Afterburner pot says 25k. CHEEZOR wrote: I just wanted to confirm that my Afterburner pot says 25k. the resistor on the left should be 2k also. askwho69 wrote: Nice one guys, i was looking for this one.. PA2 has white noise on it... they said AB is better that pa2... does anyone agree with that? i schematic is better for comparison does anyone write down the schematic? AB has a lower pot resistance ,that is one reason for being less noisy if possible. schematic is not difficult to draw,you have the pics and most of the component values,those missing are easily predictable. askwho69 wrote: I want to draw the schematics but can you please clarify this one? input cap to pin 3 usually is 100nF,for less low end decrease to 22n or 10n. Anybody has a proper schematic for afterburner? I do not know how to connect OP191. Anyone did that and it works? irek81 wrote: Anybody has a proper schematic for afterburner? I do not know how to connect OP191. Anyone did that and it works? in order to read a schematic,you need to be able to understand an opamp amplifier,in this case a non inverting one,with a +20 dB gain,nothing more than your average text book/datasheet application. Any single opamp will do,if you use a battery a TL061 is ok. I have been wanting to make one fo these for aaaages. Quick question, does anyone have a PCB layout diagram... There are a few on here, but they aren't very clear. Ideally, something I can just take and use right off. i did some homework since this is a basic circuit and could be useful to me also. if its clear and ok for your use,i can upload the printable layout,otherwise i can mod it to taste. I can't see how that pcb could work as pin 1 & 5 are not connected to anything? Also those 1meg voltage dividers for the offset bias are not ideal. If running from a 9 volt battery then a 10k/10k divider gives half voltage and then 1 meg to +input. In the case of input on the inverting input you don't need the bias just a cap as the positive input is already DC referenced. As a rule the positive input of most opamps need a DC path to ground. Better minds here might explain it better. If you wish I can draw up a schematic for you to work from. the only errors are that V+ goes to pin7 and signal out is on pin 6,but that is not important now,its already fixed in my layout,i was just asking if its ok in dimensions,type and layout of components,then i can give the layout. Regarding the schematic,it is correct 1:1 with EMG unit,so any complaint about different design could be redirected to the company. Any schematic for the AB (After Burner) EMG.And yes it´s a 25K pot.